Home > Shop > blackskull > PEPPERJACK HAZE FEMALE Sale! 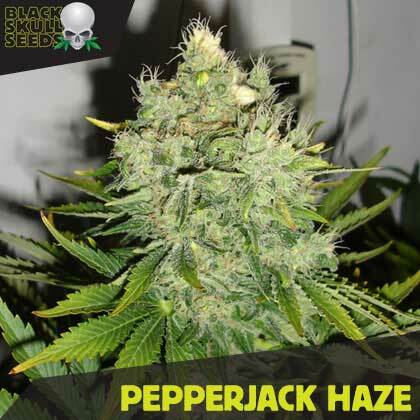 Blackskull seeds pepper jack haze is a potent mix of high yielding Indica and super strong sativas. This strain give of spicy odours and has a peppery flavour. If you are looking for a high quality sativa without the super-long flowering time then look no further than Blackskull pepper jack haze. This strain has a flowering time of 7-8 weeks and offers an uplifting high which comes from its sativa dominant genetics. Our breeders took the cannabis cup winning Jack Herer strain and crossed it will a blueberry Thai hybrid out of Amsterdam. The addition of the blueberry Thai reduced the flowering time of the Jack Herer mother and lead to increased resin production. Pepper jack haze shows great vigour from the beginning and once she enters her flowering period you will see her pack on weight very quickly. To achieve the best yields it is recommended that 3-4 gallon pots are used and she is given 30 days of Vegetative growth. In this set up you can easily see 600g per m2 indoors. Our breeders would recommend 3-4 gallon containers and a 30 day vegetative time to hit maximum yields. The smell in the growroom is typically hazy with the resinous buds giving off a spicy, peppery aroma. The effect is intense but motivating and for medical users there is an increased appetite as well as pain suppression and mood elevation. One of our favourite strains, once you have tried Pepper jack Haze you will always be back for more!